Thousands of devotees on Thursday celebrated the Holi, a Hindu religious festival of colours, across the country with due religious fervour and much enthusiasm. “Marking the festival, a large number of devotees thronged the Dhakeswari national temple in the morning to offer abir, a pink colored powder, at the foot of lord Krishna. Devotional songs were also played on loudspeakers and devotees also sang songs in praise of lord Krishna,” Dhakeswari National Temple spokesman Advocate Taposh Kummar Paul told BSS. He said the Dol Purnima begun on Wednesday and it will continue throughout the day today. The festival signifies the victory of good over evil, the arrival of spring, end of winter, and for many it is a festive day to meet others, play and laugh, forget and forgive, and repair broken relationships. The day is also celebrated as a thanksgiving occasion for a good harvest. The festival, also known as Dol Purnima (full moon day), began in the morning and continued till the afternoon amid fanfare. It also usually lasts for two days starting on the Purnima in several parts of the country. As a ritual in celebration of the festival, the devotees are visiting the shrines, temples and offering colours (abir) at the feet of Idol of the God Sri Krishna and Goddess Sri Radhika. Abir Khela (game), a significant part of the festival, means throwing of abir, a kind of perfumed and pink coloured powder and different other colorful powders by revelers on each other making festival-goers coated in colour to make the extravaganza enthusiastic. In the morning today, the premises of Dhakeswari National Temple wore a festive look with the ‘abir khela’ participated by a huge number of devotees, especially young men and women. Clad in colorful shares or punjabees, hundreds of devotees joined the one of the biggest celebrations of the Hindu community in the present days. “We came here to offer abir on the feet of lord Krishna and enjoy the Holi festival through abir khela which is the major part of the celebration,” Tamalika Mukherjee, a devotee, said. A huge number of non-Hindu community members also joined the festival on the premises of Dhakeswari temple imbued with the immortal non-communal Banglaee culture. “Every year, I come to enjoy the festival with my Hindu friends. Nowadays, every single religious festival become a festival for all community members,” Mehedi Hasan, a reveler, said. Apart from Dhakeswari National Temple, Mahanagar Sarbajanin Puja Committee organized worshiping and Kirton (devotional songs) in the morning. Abir was offered at the feet of idols of Radha Krishna and Chaitanyadeb. Devotees also offered the Abir to god and goddess. Besides, the festival is being celebrated at different temples across the country, including capital Dhaka. 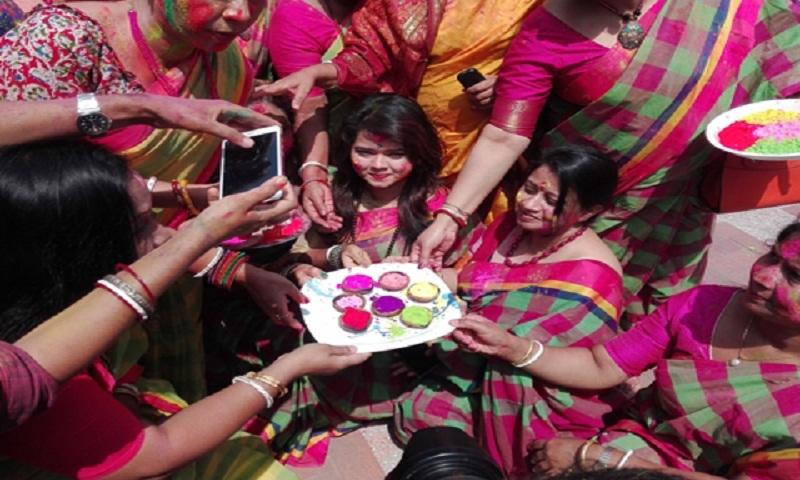 Marking the festival, the Dhaka University campus, especially Jagannath Hall and Fine Arts Faculty, wore a festive look as hundreds of youths irrespective of religions, castes and creeds celebrated the festival with different colors. They celebrated the festival by colouring the fellow devotees and taking their photographs and selfies.